Will it be Justin on Lucas for Adrienne, in the Days of Our Lives spoilers. The Days of Our Lives spoilers for Wednesday, March 29th, predict that Adrienne makes an important decision concerning her love life. With her recent health issues, Adrienne (Judi Evans) has been dealing with a lot. 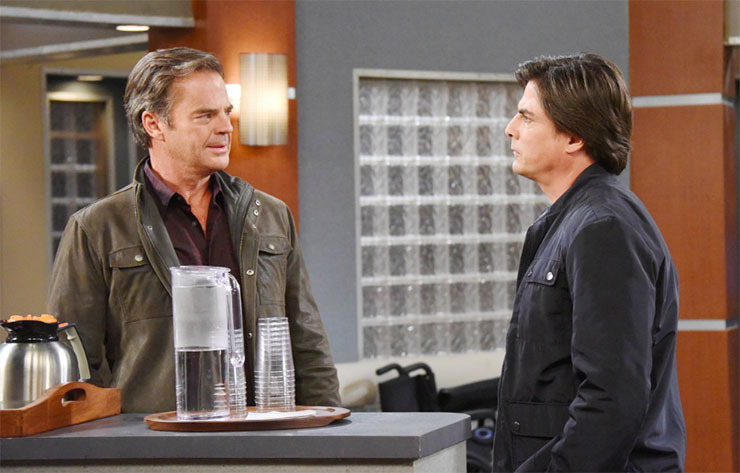 Justin (Wally Kurth) and Lucas (Bryan Dattilo) and both mean a great deal to her, but she can only have one. Perhaps choosing between them now would also give her a sense of control in a time when she may feel she doesn’t have as much as she’d like. Wednesday she finally selects who she wants to be with. Steve (Stephen Nichols) and Kayla (Mary Beth Evans) worry about Joey (James Lastovic). They’re not certain he can keep the truth about Ava to himself. This is especially worrisome considering Tripp (Lucas Adams) makes a mysterious phone call to dig up more intel on his late mother. Tripp is new in town and on our screens. There’s no telling how he’ll react if he learns Joey killed his mother. It’s generally not something most people would take very well! Gabi (Camila Banus) is doing better, thankfully, after Deimos’ (Vincent Irizarry) latest stunt had her hospitalized and fighting for her life. Wednesday she may have some help recovering fully, not to mention getting over Chad (Billy Flynn). Wednesday she and Eli (Lamon Archey) get to know each other a little better. Will their getting closer also help pin the crimes Deimos committed on him? Next Article Soap Cities Reader Profile #8: Danielle Graham, Soap Event Connoisseur!